This is a great opportunity to avoid the hassles of getting the house ready to list. It also provides the power of having a house under contract while looking for the next one. If you or someone you know is considering a move and has a match for these buyers please let us know as soon as possible! Wondering what to do with “extra stuff”? North Fulton Community Charities (NFCC)-They pick up! One of the ways Dress for Success helps women take the first steps to self-sufficiency is by providing them with appropriate interview attire to make the best impression possible. Great place to donate unwanted office attire! At this location, you will be required to carry your items to the lower level. So instead of dumping stuff at the curb or in a box in a shopping center somewhere please consider donating your unwanted items to one of these awesome organizations. It’s a good thing & you’ll have some great deductions for next year’s tax return. Just Listed – Wonderful West Cobb!! •Tons of Upgrades- NEW carpet! NEW granite! Fresh Paint! •Rocking Chair Front Porch-Greets guests & adds charm! •Inviting 2 Story Foyer –Vaulted ceiling, hardwoods, NEW chandelier to welcome visitors into your new home! •Kitchen – NEW granite counters, under mount sink, NEW lighting & plumbing, pantry, wood floors & wood cabinets! •Breakfast Room – Vaulted ceiling, ceiling fan & French door to deck! Bay window overlooks backyard! •Great Room – Freshly painted, vaulted ceiling, ceiling fan, crown molding, picture window & cozy fireplace w/gas logs! •Dining Room – NEW carpet, NEW chandelier, crown molding, off kitchen; excellent for entertaining! •Family Room/Rec Room/Bonus Room-On lower level; lots of possibilities, you choose! Exterior door leads to patio & yard! •Master Suite –Freshly painted, NEW carpet, vaulted ceiling, walk in closet, 2” blinds & ceiling fan! 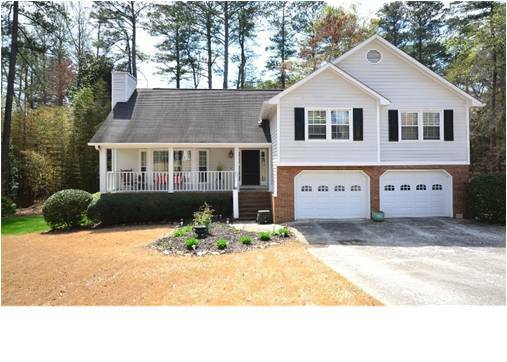 •Master Bath – Tile floor, updated plumbing & lighting fixtures, garden tub, separate tile shower & 2” blinds! •Generous Secondary Bedrooms –Ceiling fans & 2” blinds!! •2 Car Garage- Auto openers & newer, insulated door! •Laundry Room-On lower level, extra space for storage! •Delightful Deck- Grill out and wash the day’s troubles away as you relax in nature’s realm & lush landscaping! •Private, Wooded, Level Back Yard – Play, garden; plenty of room for everyone! Cute outbuilding for extra storage! •Energy Efficient-Thermal, tilt out windows & ridge vent! •Sought After Neighborhood-Active swim community! •Great Location-Just minutes to Historic Marietta Square, Avenues of West Cobb, Silver Comet Trail & more!